Naturally, you can talk to Cortana via the Surface Headphones. And what she tells you is for your ears alone. If the theme of Microsoft’s Tuesday Surface event was about maintaining focus, then the new Microsoft Surface Headphones fall right in line: Spin the noise cancellation dial on Microsoft’s new cans, and the world fades away. Headphones aren’t usually considered to be a PC accessory, but anyone who’s worked in a coffee shop—or the office equivalent, the dreaded open-plan office—knows that casual conversation and cup clinks can be enormously distracting. 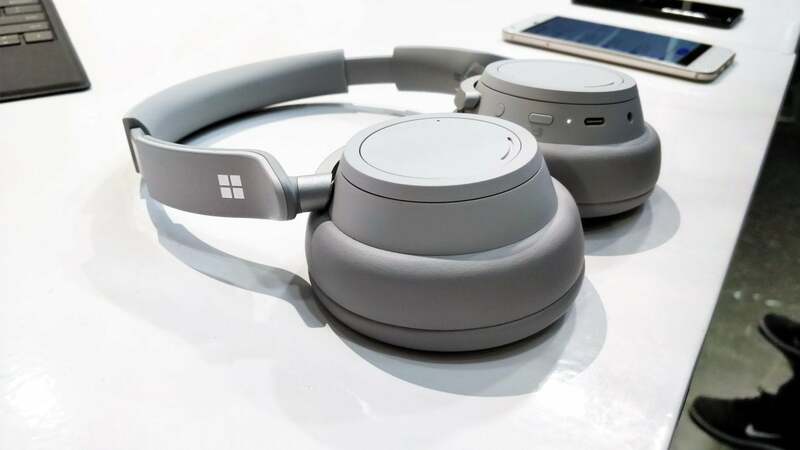 Enter the $349 Surface Headphones, Microsoft’s over-the-ear headphones that feature both active noise cancellation as well as a connection to Cortana, Microsoft’s voice assistant. (The Surface HeadphonesRemove non-product link are available for preorder on Microsoft's site.) Like mice and keyboards, headphones are a subjective experience—we all experience them differently on our ears. I found the Surface Headphones a bit confining during my first interaction with them, though the noise cancellation worked well in the loud, bustling environment of Microsoft's demo space. Oddly, the Surface Headphones are the only one of the Surface devices that Microsoft launched that aren’t in black. Dimensions: 8.03 in. 7.68 in. x 1.89 in. At $349, the Surface Headphones are priced almost identically to the Sony WH-1000 series and the Bose QuietComfort 35, two of the top noise-cancellation headphones on the market. 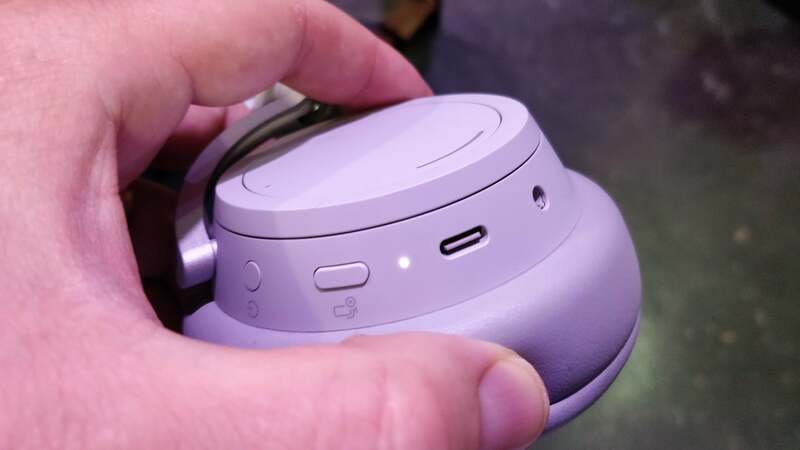 While the former is rated highly for its sound fidelity and noise cancellation, the QuietComfort line adds the Google Assistant, too. The Surface Headphones include Cortana, but the digital assistant isn't necessarily the headline feature. The Headphones cups are made of an unspecified faux-leathery material, and felt comfortable if not a bit snug. (To be fair, I made no attempt to adjust them during the few minutes that I had with them.) I didn’t have an opportunity to test how well they perform when playing a variety of music, either. But maybe this doesn't matter, as it appears the main selling point of the Surface Headphones is noise cancellation. That feature certainly works. The Surface Headphones include two free-spinning dials. Rotate the one on the left , and active noise cancellation dials up and down. The right dial controls volume. There’s also a small button on the right cup—which probably should either be larger or more pronounced—to mute the mic in case you don’t want Cortana to activate. There’s a separate power button, too. Here’s a close-up of the Microsoft Surface Headphones controls. The small round port to the right is for a corded connection, while USB-C is used for charging. Microsoft says that the Headphones have four active mics to detect and cancel out sounds, and when I dialed up noise cancellation, virtually all of the ambient noise disappeared into the background. Sharp sounds near me (such as my fingers snapping) came through clearly, and a nearby speaker’s voice came across as a bit hollow. But otherwise the Headphones seemed to do what they were supposed to: filter out background noise, and do it very well. It’s worth noting that the noise cancellation never quite goes away. Part of that may be due to the passive noise cancellation technologies built in, as well. But when you dial down the noise cancellation to its minimum level, the ambient noise still sounds a bit alien, which I think I personally might find distracting. Microsoft says that Cortana will be accompanied by a respin of the Cortana app for Android and iOS phones. I tried connecting to Cortana using the Headphones, but the assistant was either unavailable or couldn’t connect in the congested wireless environment of the demo hall. Adjusting the volume and noise cancellation on the headphones will be mirrored on the app, and vice versa. It doesn’t sound like there will be quite the range of configurability that accompanies Sony’s WH-1000 series, which can provide some directional controls for sound sourcing, depending upon the model. There’s one advantage that I can think of when using Cortana in this environment: privacy. There’s a definite “is anyone watching me?” factor when using a digital assistant in public, as anyone can overhear your query. Microsoft’s also pitching Cortana as a business solution. The fear of someone overhearing your business calendar as it’s being read to you should go away with the Surface Headphones. The Surface Headphones certainly arrived as a surprise announcement, and the price will obviously turn some people off. But I just wish I had a pair for the flight home.